Even homeless, Common Cider Co. is cleaning up at international cider competitions. Founder Fran Toves currently produces her nectar at Drytown Cellars in Amador County. The grounds are beautiful, studded with colorful rose bushes, friendly dogs and giant tanks of fermented goodness. Toves herself sort of lives out of a hotel room, constantly traveling for her rapidly expanding business. But that will soon change. This fall, Common Cider Co. will open as a cidery and taproom in Auburn down the street from Knee Deep Brewing Company—a soon-to-be obvious destination street for craft beverage enthusiasts. Inside a shipping container or out on a sunny patio, sip on Common Cider’s award-winning Hibiscus Saison or Blood Orange Tangerine ciders. Ah, bliss. Granted, those ciders are pretty easy to track down in Sacramento. In a matter of weeks, we’ll start seeing the Hibiscus Saison and Blood Orange Tangerine in slim, sophisticated cans on grocery shelves. Then there are the 100 regional spots serving Common Cider on draft. For just two-and-a-half years in business, Common Cider has really taken off. “We saw a niche for more foodie-type ciders that are more approachable, not sweet and full of flavor,” Toves said. Hard cider is the fastest-growing alcoholic beverage in America. Most attribute it to the rise of craft beer and growing interest in all things artisanal and experimental. The recent demand for gluten-free everything helps, too. Common Cider’s “foodie” ciders are dry, subtle and delicate—you can easily imagine them pairing with lots of cuisine even better than beer or wine. On the Brix scale measuring sweetness, Toves’ ciders reach about 2.2, while most commercial ciders hit 8, Toves said. Among recent accolades: Common Cider’s Hibiscus took home a gold medal and cider of the year award at the New York International Beer Competition this year. And a few weeks later at the Great Lakes International Cider & Perry Competition, Common Cider won five awards—one for each of its ciders. As beer manager at Nugget Markets, Michael Taylor stocks Common Cider at all his stores. He said he was immediately drawn to Common’s flavor profiles. That yeast is typically found in saison beers. The result pours hazy and provides a fuller mouthfeel than ciders made with champagne or ale yeast. Some of Toves’ special creations sound like a chef’s work of art: toasted coconut cream cider with pineapple and vanilla, served on nitro; apple infused with rose petals and lemon; or blackberry “sangria” with mango, citrus and red wine. The latter is a seasonal offering that should hit the shelves this month. Sure enough, Toves boasts a culinary background. She spent years taking food products from concept to market in the organics world. 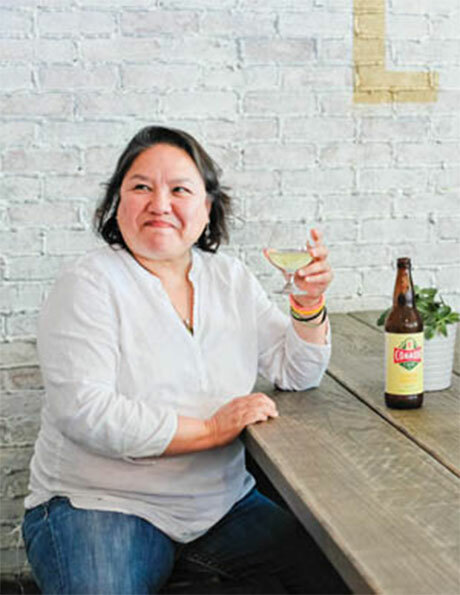 Her website has a section devoted to cider and food pairings—cheese being the guaranteed winner with ciders—and she plans to add an e-book with cider cocktail recipes. Think Blood Orange Tangerine cider with elderflower liqueur, orange bitters and mandarin vodka shaken over ice. She hopes to start producing barrel-aged ciders in the near future as well—but not your usual apple cider in bourbon barrels. “I didn’t want to open a brewery,” she said, laughing. The short story is that Toves entered three ciders into a home brew competition in 2012, and all three placed in the top 10. Clearly, she had a talent. The longer story starts with uterine cancer hitting Toves at age 27. She wanted her life to change; she wanted work for herself. She toiled away as an information technology consultant for years—she got her degree from Sacramento State University—before getting tired of the restless computer crunching. She had always loved cooking—she grew up in Guam, the second oldest of eight children—and went into food. Then food spawned her interest in alcohol. And as a cancer survivor, Toves chose to make Common Cider Co. all about spending time with loved ones. It’s in the company’s tag lines and marketing materials, and she truly believes it. “Life is just too short,” she said. It’s not quite a family business, but Fran’s family members like niece Kayla Toves (left) have rallied behind Common Cider Co.
Now, Common Cider produces 30,000 gallons a month and gets distributed throughout California, Nevada, Utah and Hawaii. Toves is focusing on warmer states—there are already rich cider scenes in the Northwest, Northeast and Midwest. A lot of that has to do with the region’s apples—cider is hot all over the country, but there’s a scramble for fruit. Toves purchases locally from Barsotti Family Juice Co. in Apple Hill, but some of Barsotti’s apples actually come from Oregon. Why the struggle? Before Prohibition, everyone drank cider—it was safer than water. Legend goes that President John Adams drank a tankard for breakfast every day. According to Michael Pollan in The Botany of Desire, 99 percent of apples were drunk before 1900. After the turn of the century, 99 percent were eaten—cider apple trees got chopped down with Prohibition. And this bit of history is actually where Toves got the name for Common Cider Co.